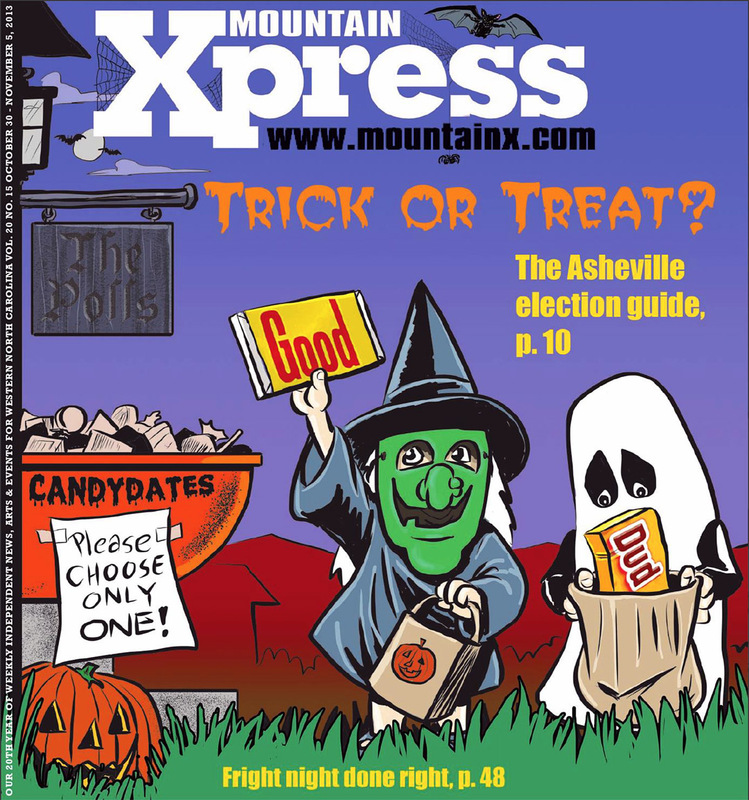 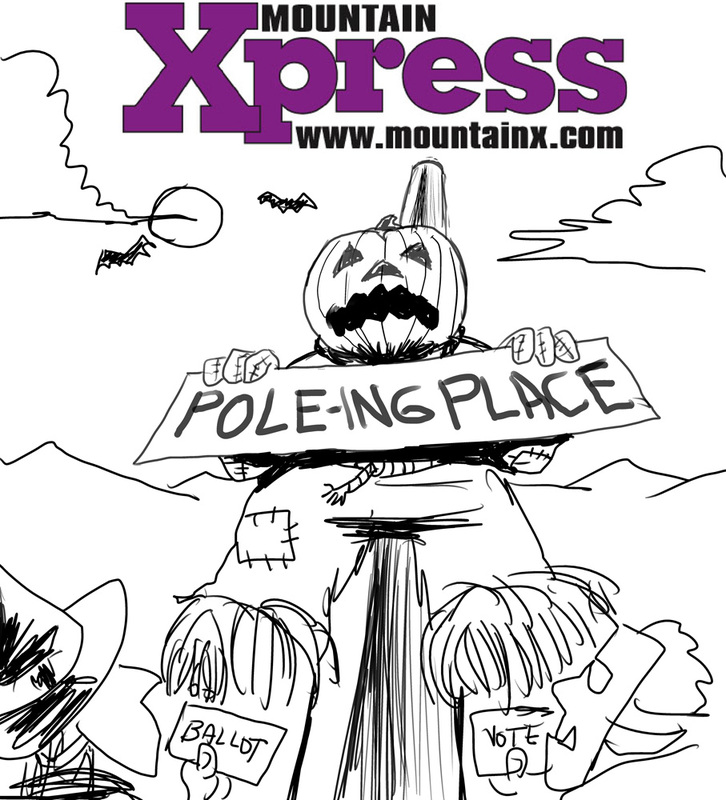 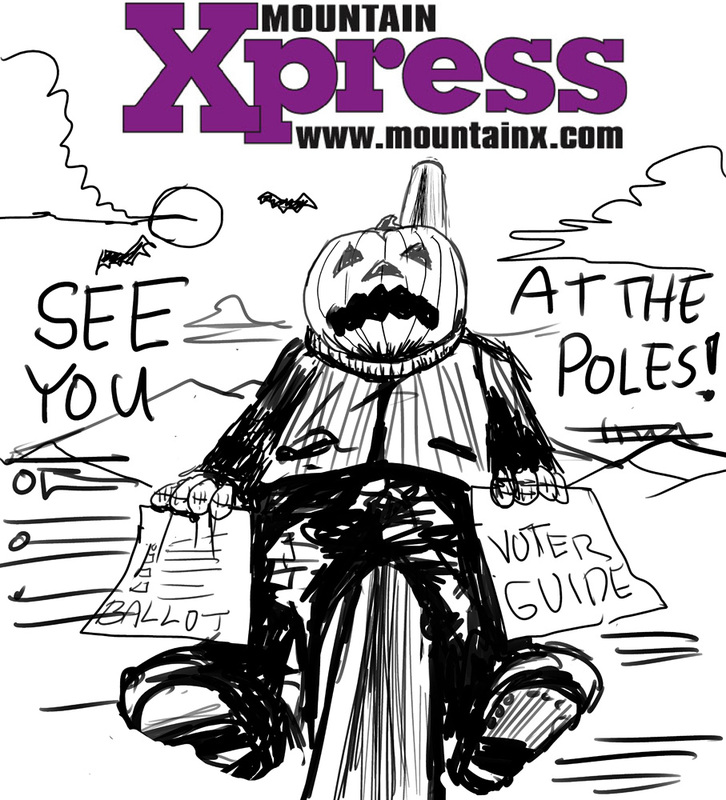 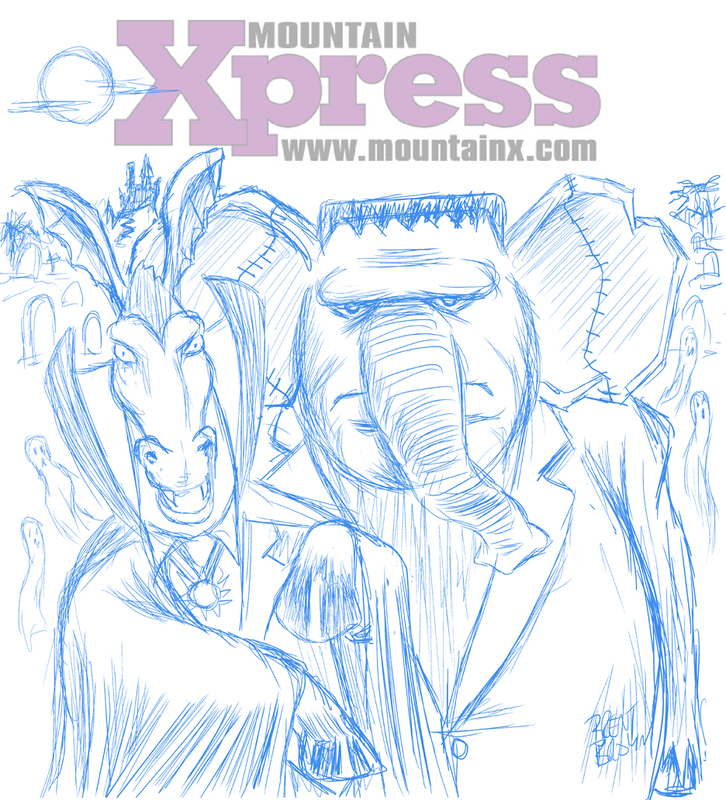 For the third year (not in a row) I’ve been commissioned to come up with a Halloween themed cover design for the local Asheville alt weekly paper, The Mountain Xpress. 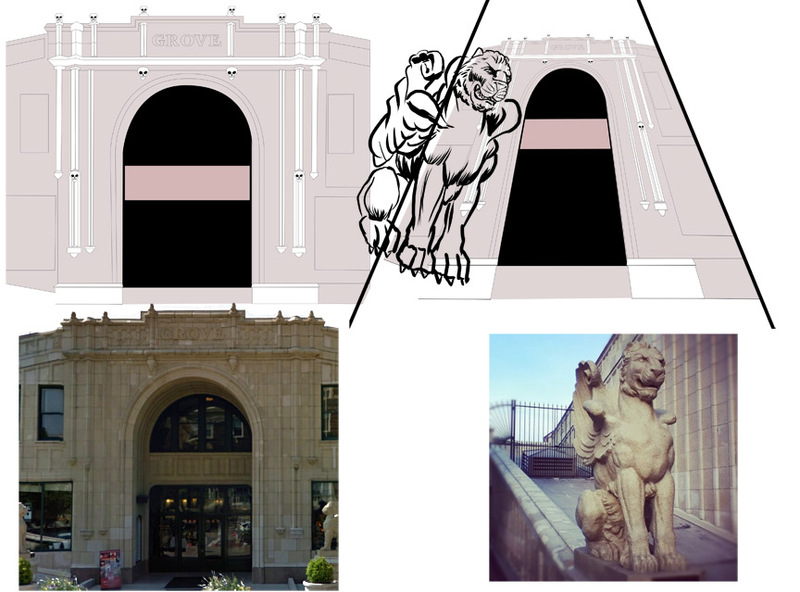 This year I was asked to do something with local architectural elements, such as the winged lions (I’ve been told they are not griffins, as they do not have the head of an eagle, just the body of a lion, with wings, but then again, I’ve read they could be either) at the Grove Arcade building. 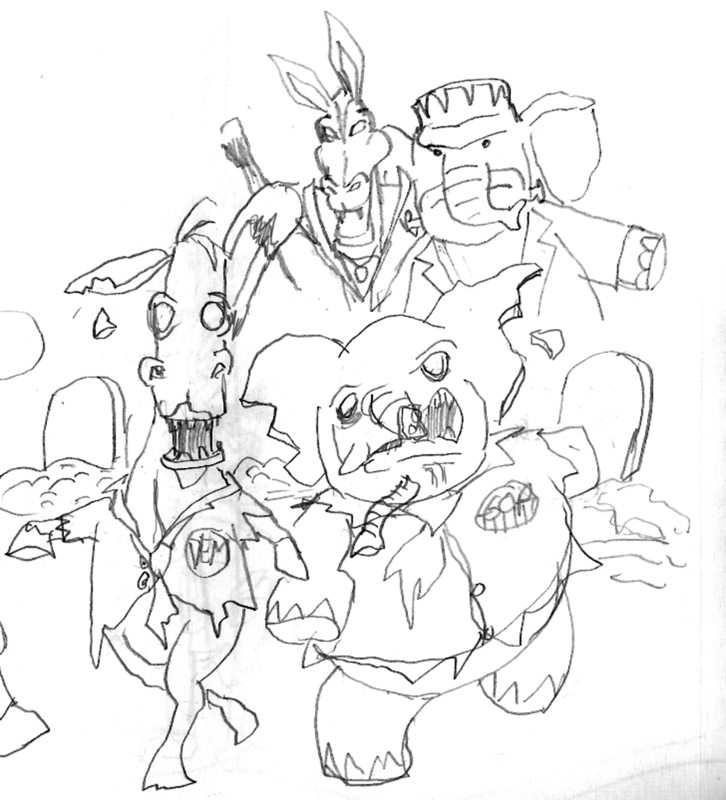 I toyed with a few ideas and we narrowed it down to just the lion statues at the Grove Arcade. 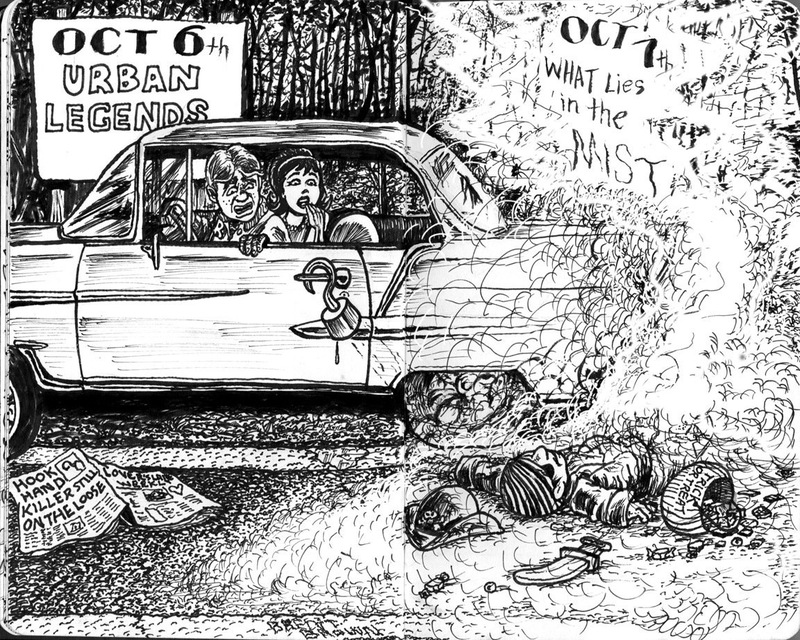 I thought that was a cool thing to play with, so I looked the historic structure up on Google Street View to get a straight-ahead view of it, then took it into a vector program and made a simple vector-art version of it that I could then distort into an extreme, bug’s-eye view perspective to add some dramatic flair to it. 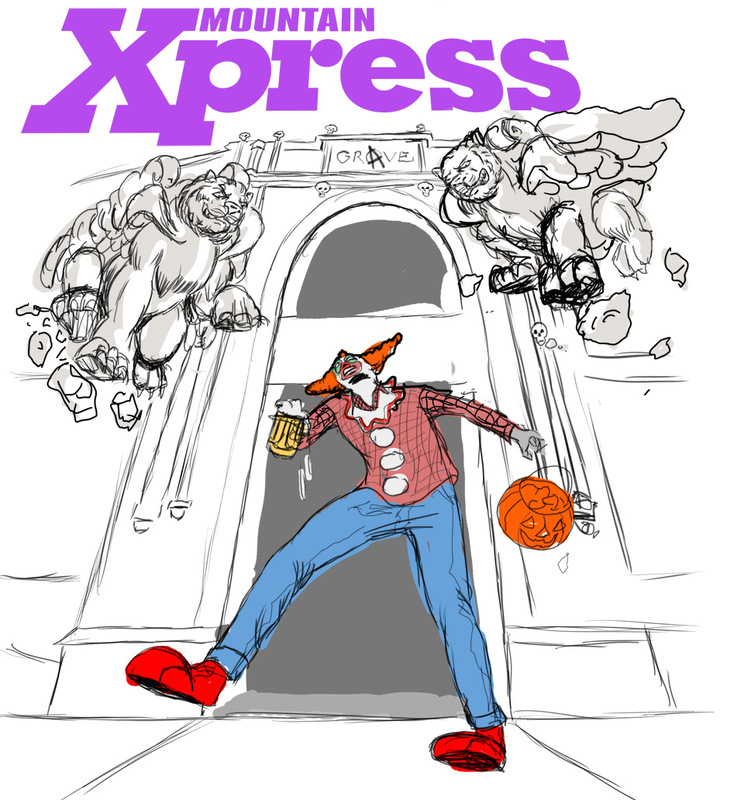 I then used the handy 3-D artist’s model bodies in Manga Studio (now called Clip Studio Paint for some reason) to get the correct perspective and anatomy for the hipster-clown the animated architectural animals would be attacking on All Hallow’s Eve. The gryphons/lions I had to just create from a reference photo and so their perspective is not as extreme, since I wanted to keep them recognizable in their newly-animated, attack versions and I also had to kind of figure out their perspective on my own. 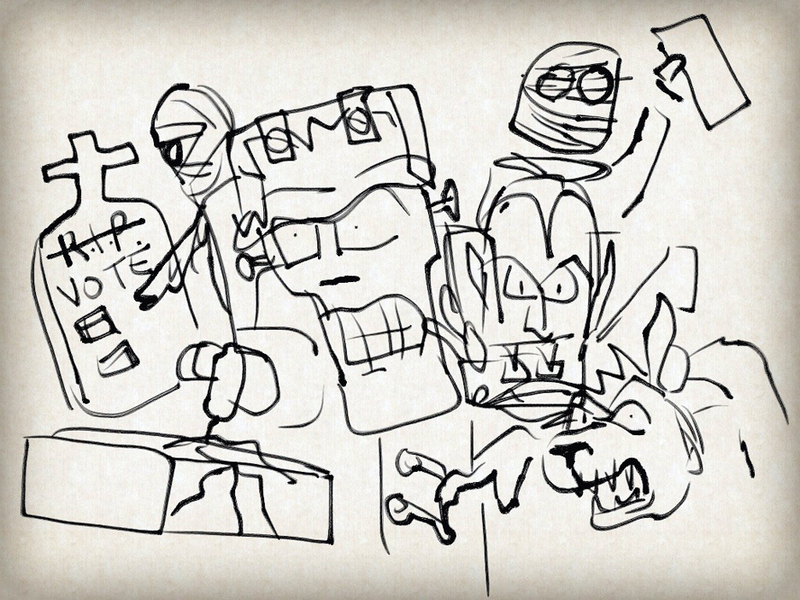 Then, it was just a matter of drawing the correct details on the reference model, arranging it with the lions I drew, rendering out lighting and shade and details on the Arcade and generally improving the whole composition, while leaving space for the heads and subheads that were to come in later. 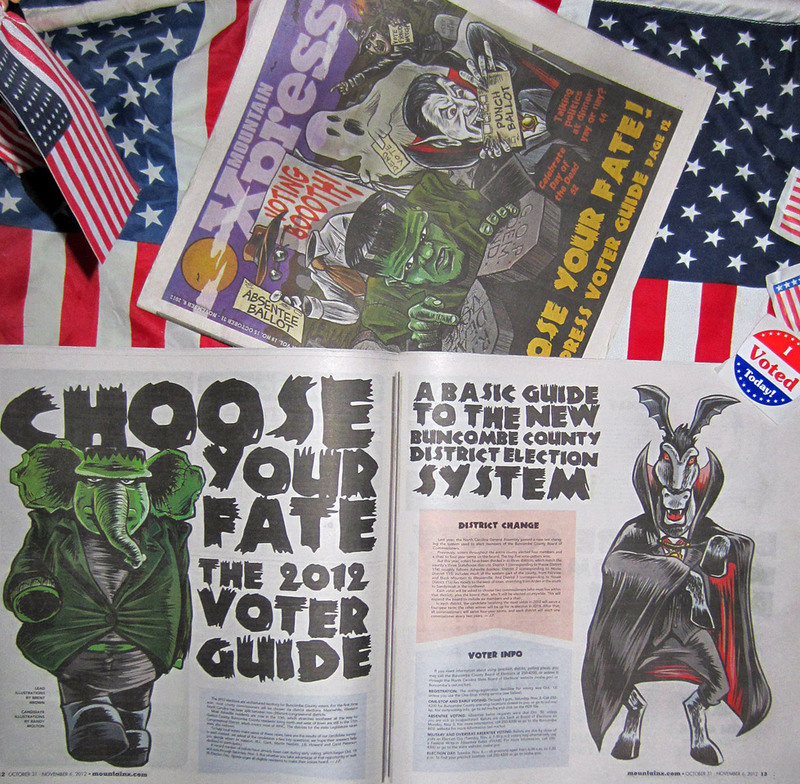 The previous covers combined Halloween with the election, since they fell so close to the same time that year. 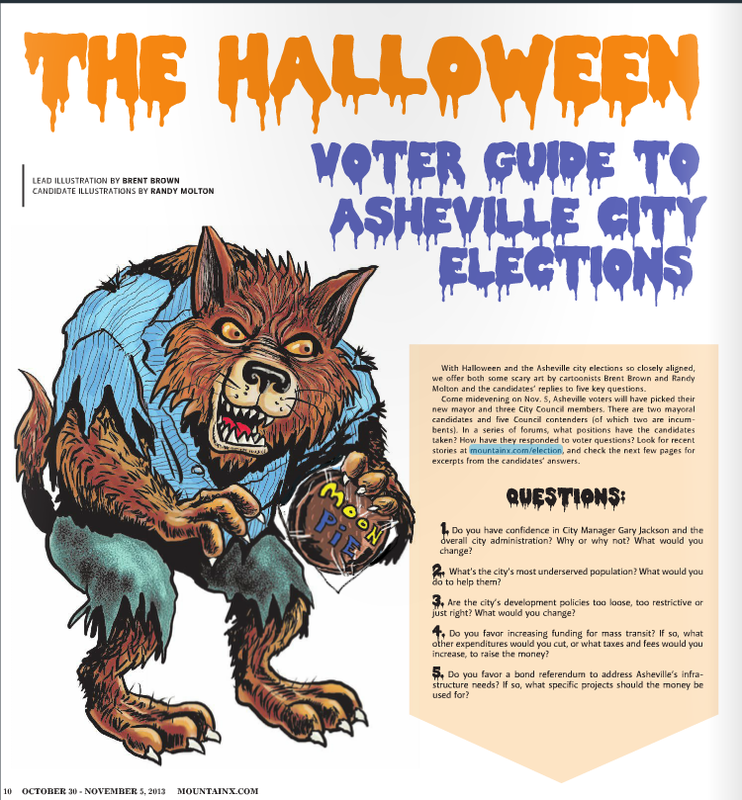 That was fun, but also hard to come up with anything new that hasn’t already been done before since the last day in October and the first Tuesday in November are always in close approximation each year and it’s a visually and satirically temptation to want to somehow link the two. 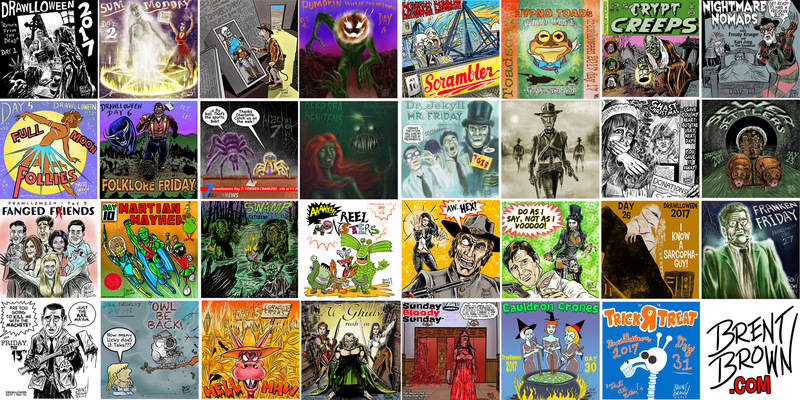 I was glad I didn’t have to do that this year, as I had already used up all my ideas previously. 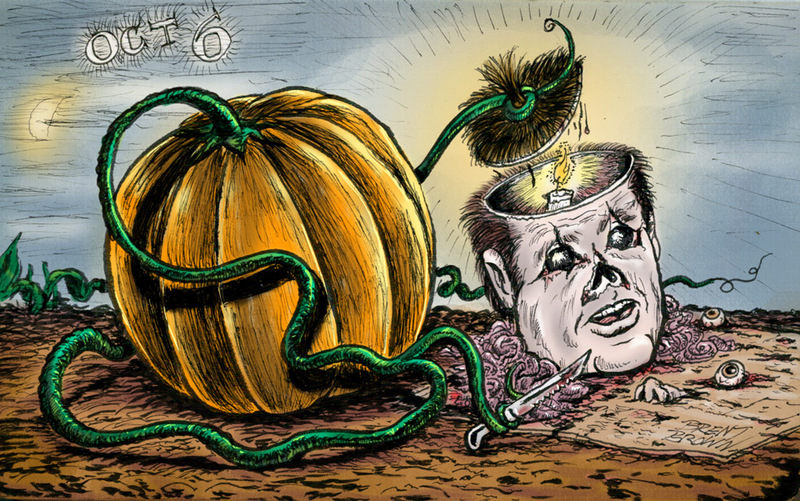 I had to put a spin on the usual Jack-o-Lantern, so I reversed the roles and had the pumpkin carving a human and getting out all the messy insides before lighting a candle to illuminate the creepy gourd-replacement. 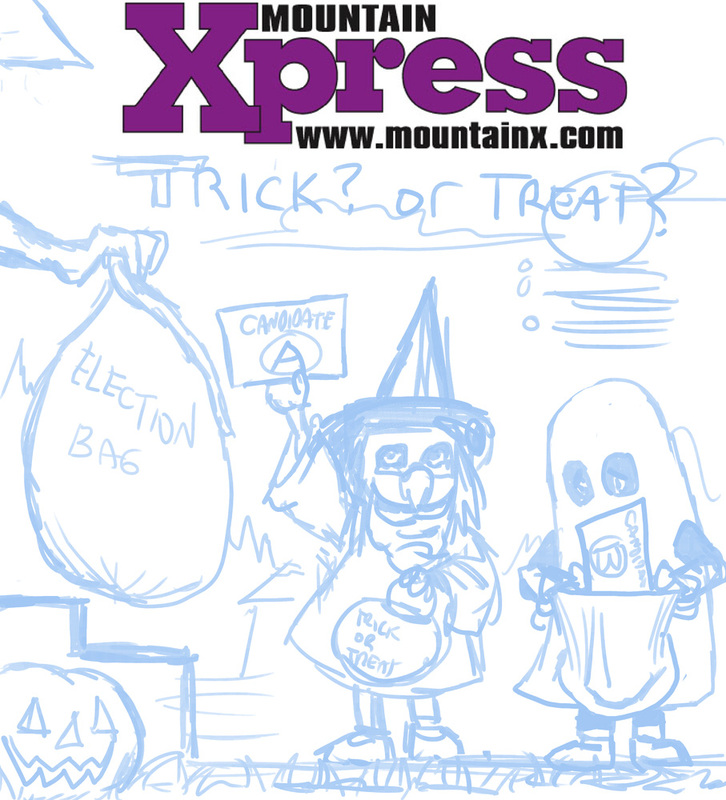 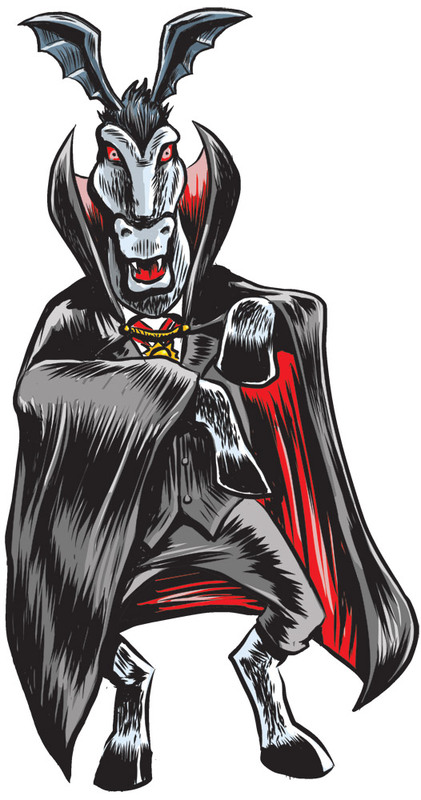 In 2012 and 2013, the alt-weekly paper I do a weekly cartoon for, The Mountain Xpress in Asheville, NC, has asked me to come up with and create a Halloween-Election themed cover for that particular week’s issue. 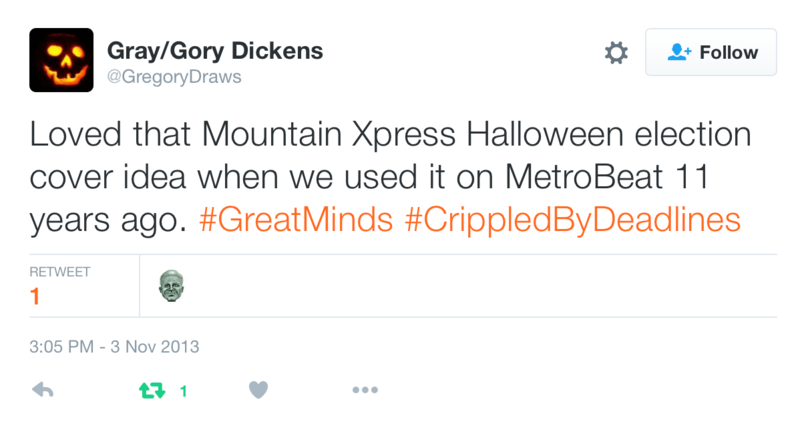 This year, they just wanted Halloween ideas , but local Halloween ideas. 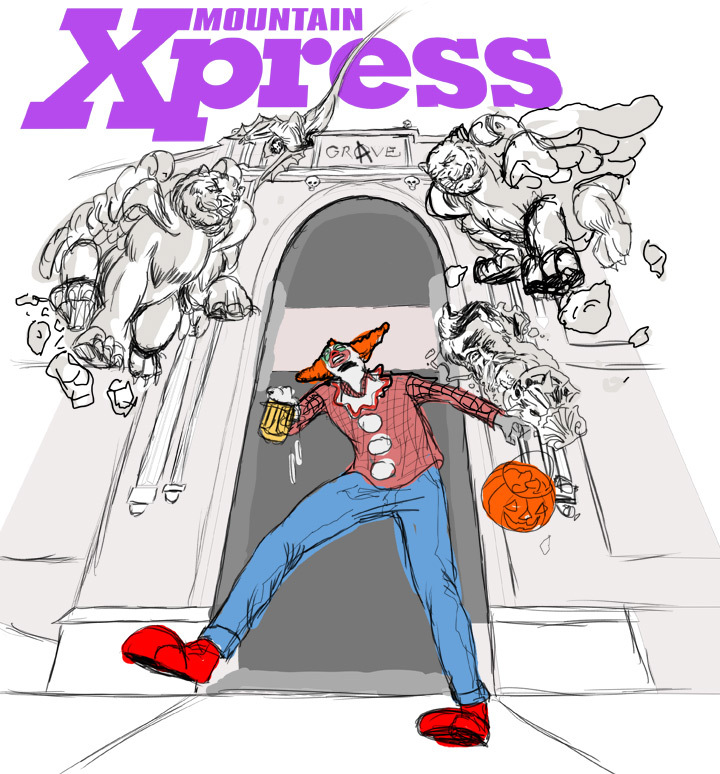 So I came up with a bunch, mostly playing on the current “beer city” spate of breweries and such that seem to be cropping up locally. 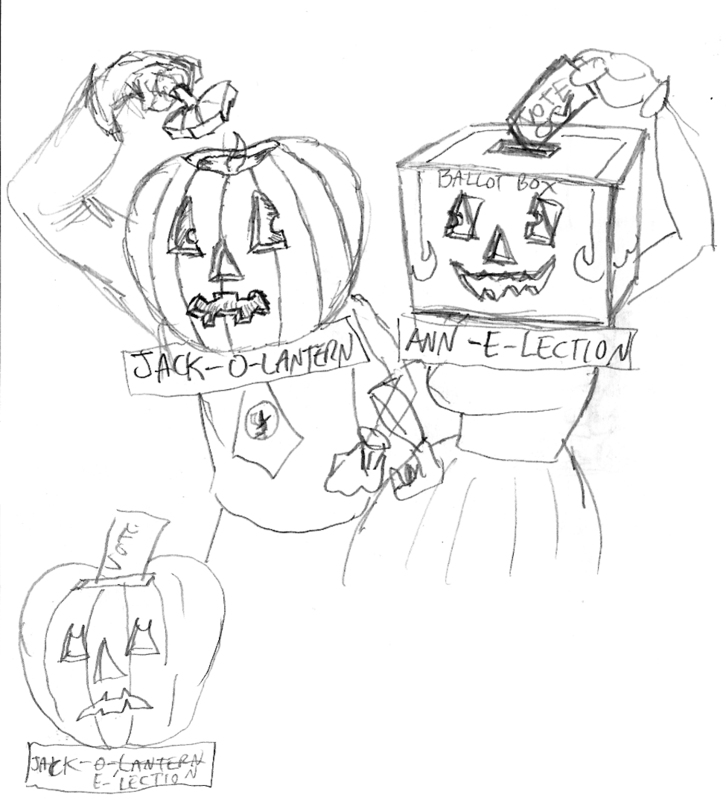 Then Margaret, one of the editors tells me, “Looks like we’re going a different direction for the cover for Oct. 29, but I like your cartoon ideas for that issue.” So I used some of the ideas for my usual (but not as high-paying as a cover assignment, just the same amount of work) inside cartoon. 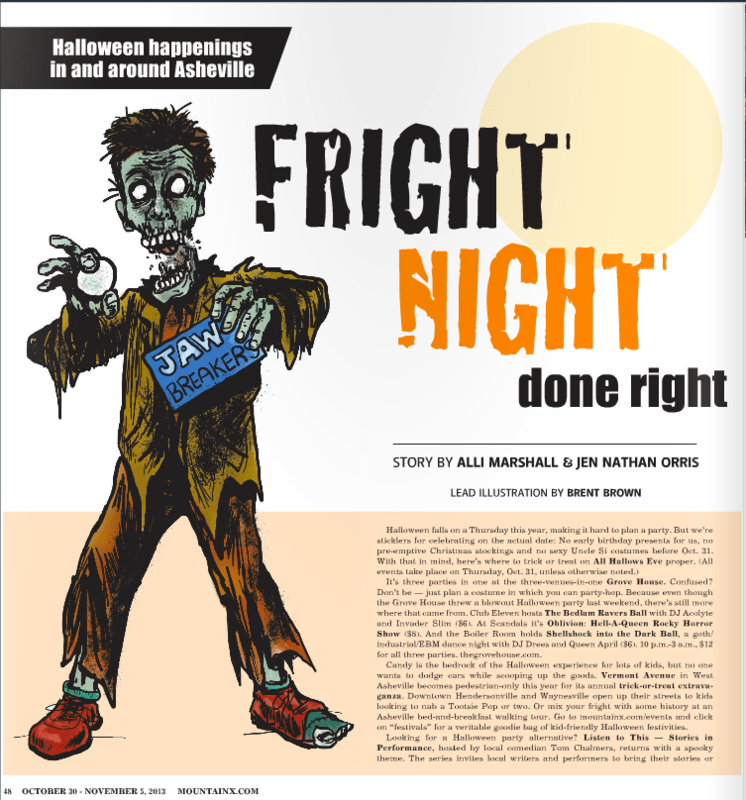 For the cover, they ended up not going with a humorous cartoon theme, but rather using a nicely done, local landmarks, spooky cover design from Jason Krekel instead. 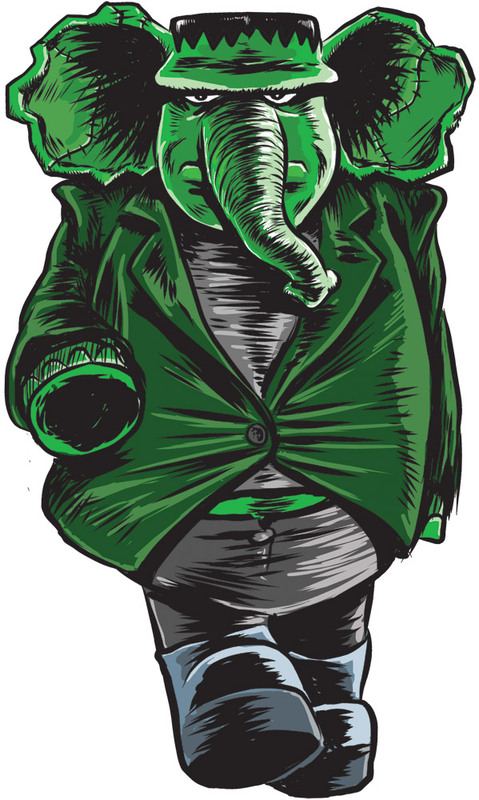 I think it turned out well, but I kind of wish they had just decided to do that from the beginning, and not wasted my time. 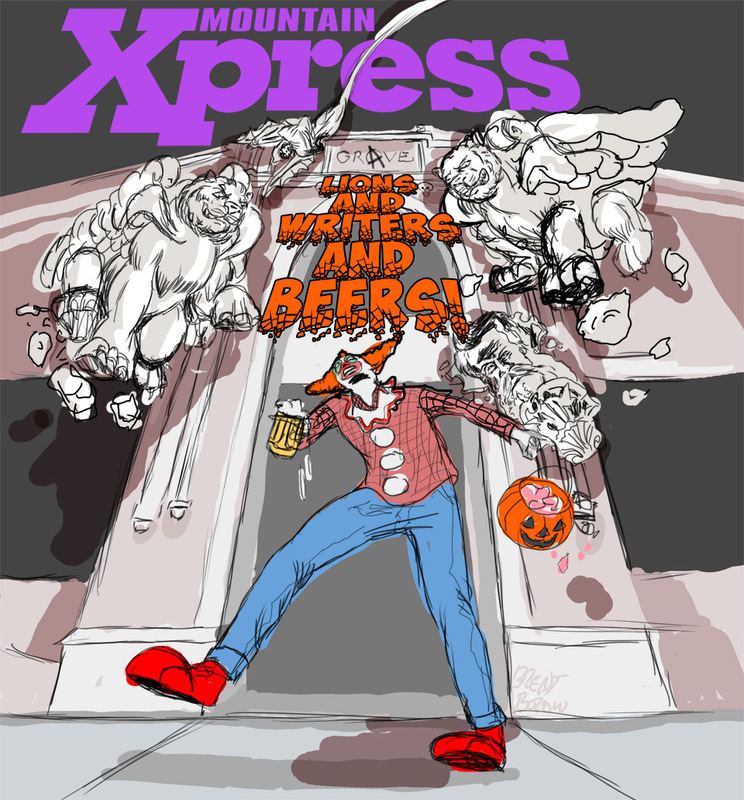 Horizontal version, as ran in the printed issue. 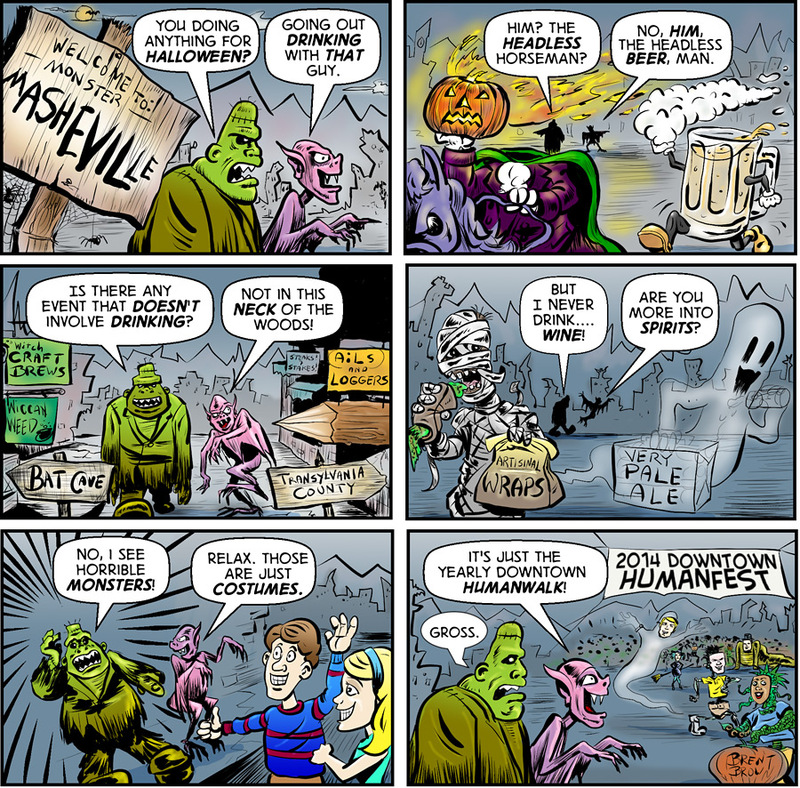 Click to make larger. 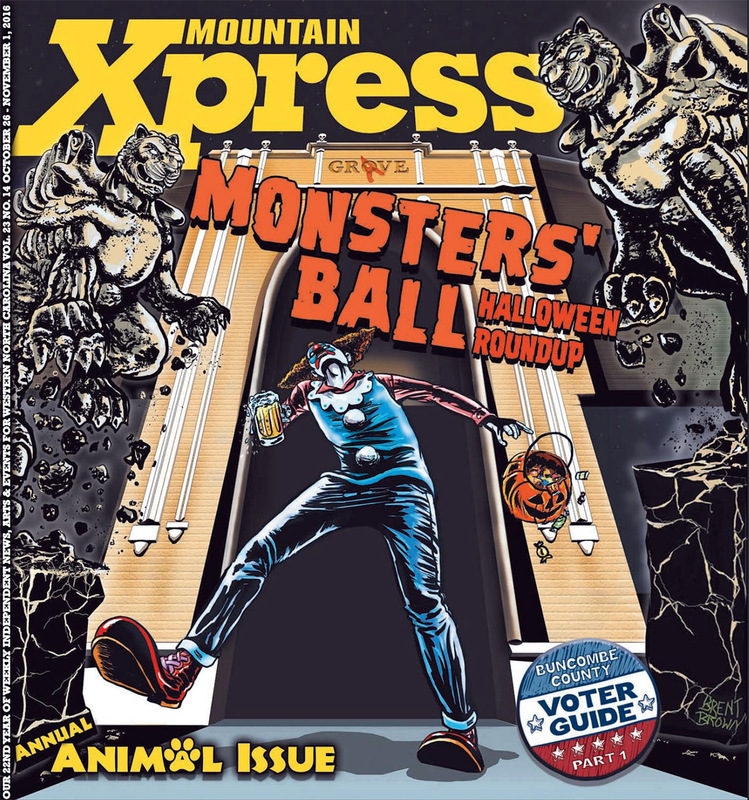 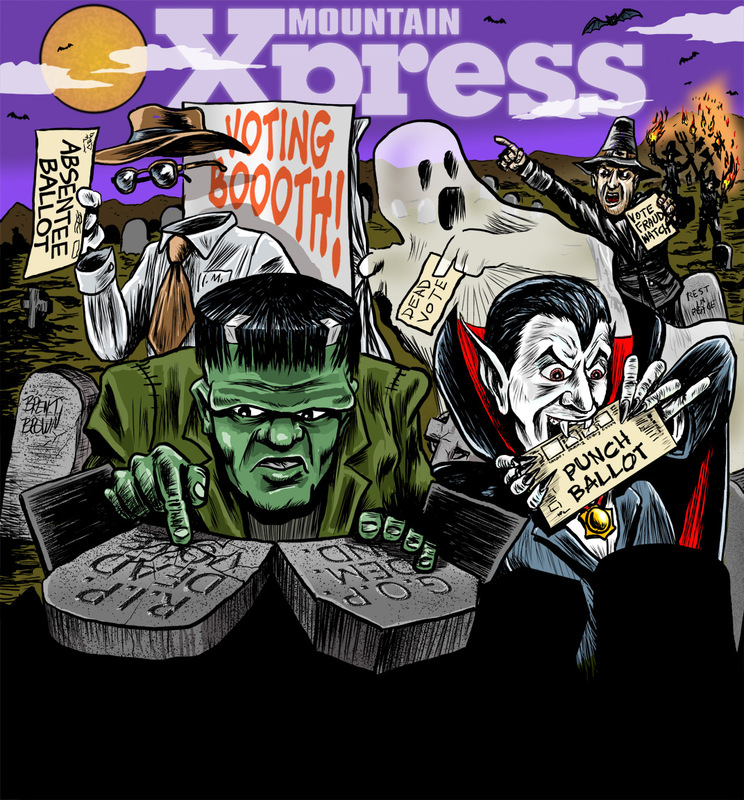 Last year I did a Halloween/Election cover (and inside Halloween art) for the local alt-weekly paper in Asheville: The Mountain Xpress. 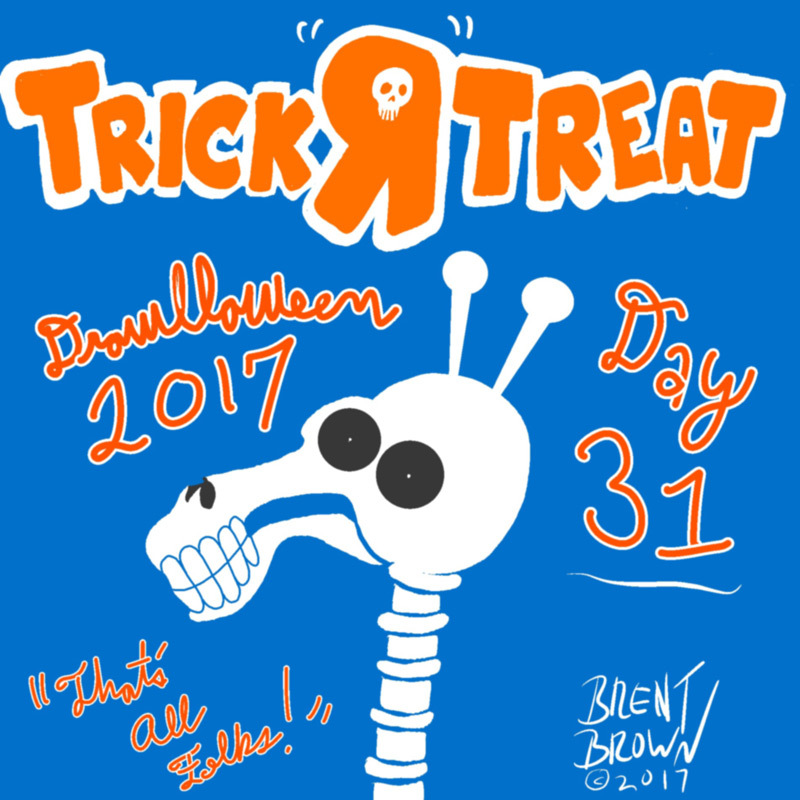 This year, they wanted another one, so I had to come up with a new idea and it was a little harder to try to combine the two. 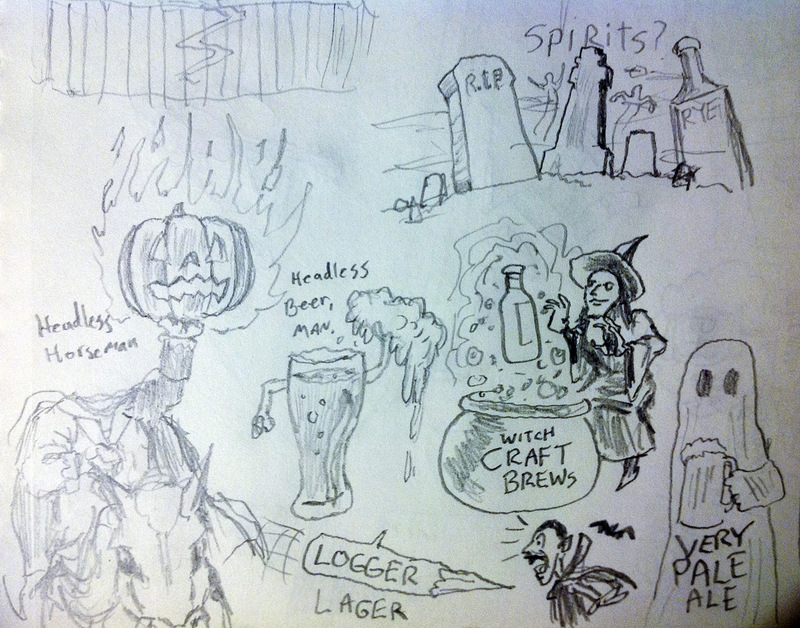 Here are some of the things I doodled and brainstormed on before coming up with the one we used. 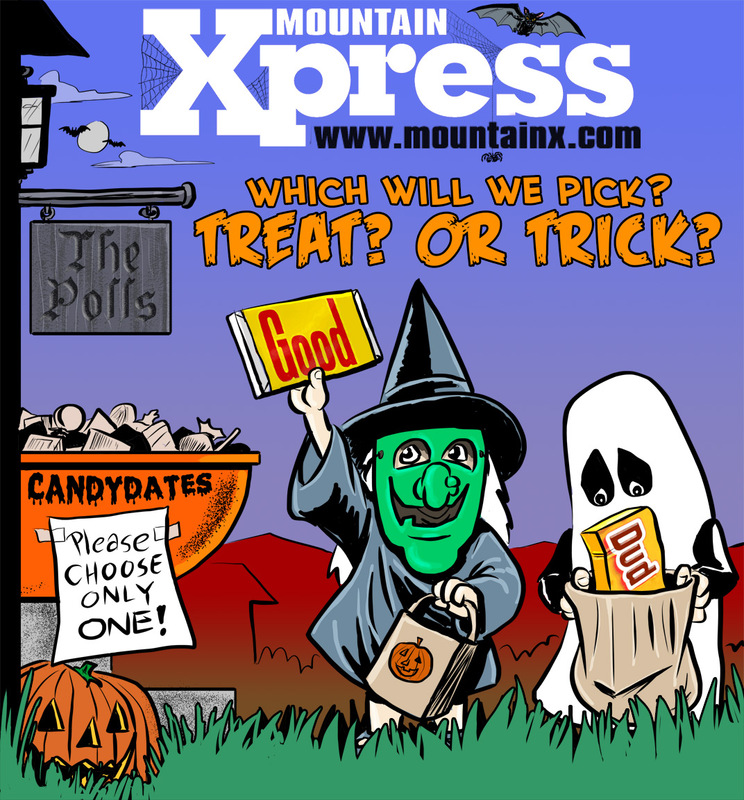 I thought it was funny using the names of actual candies like Mr. Goodbar and Milk Duds to represent candidates that may be good or duds and having the costumed children/voters have to just pick one and hope for the best. 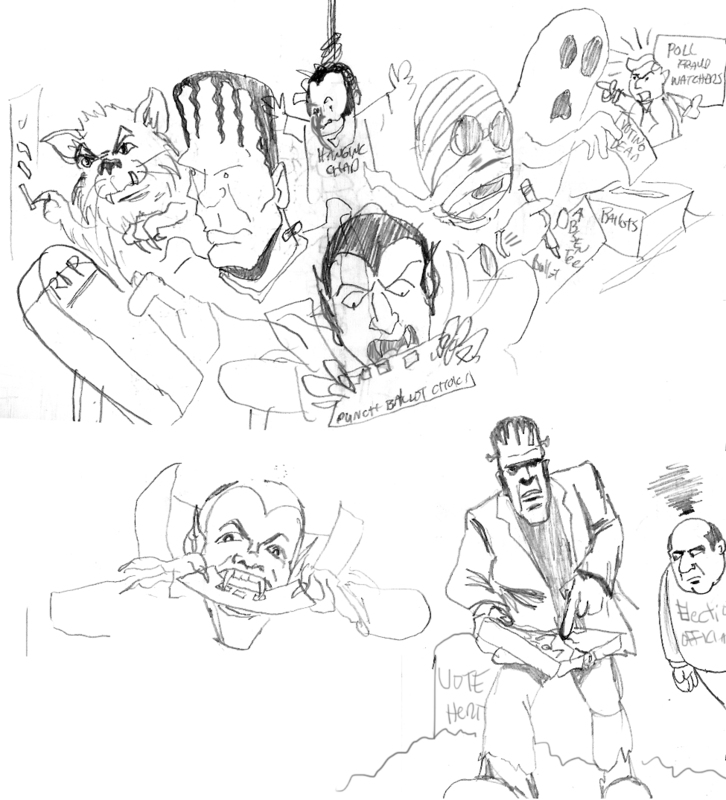 Some people didn’t think it was an original idea, but I promise if it was not, it was unintentional, as I can’t claim to have read every single other publication in every little or big market in the previous decades to make sure we were using something no one had ever thought of before regarding the common occurrence of these two events being so close together! 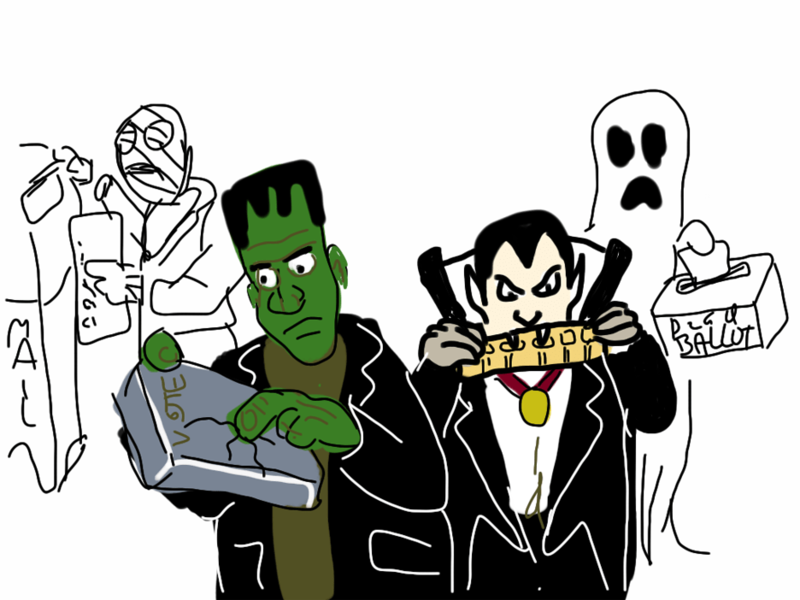 Some of them actually got used! 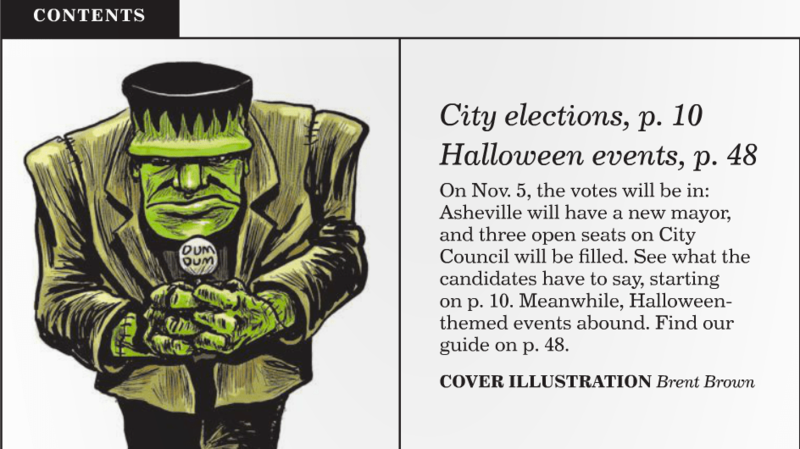 The local alt-weekly paper in Asheville, NC that I draw a weekly cartoon for asked me to draw a humorous Halloween and Election cover for the issue that would fall on the week of both those events. 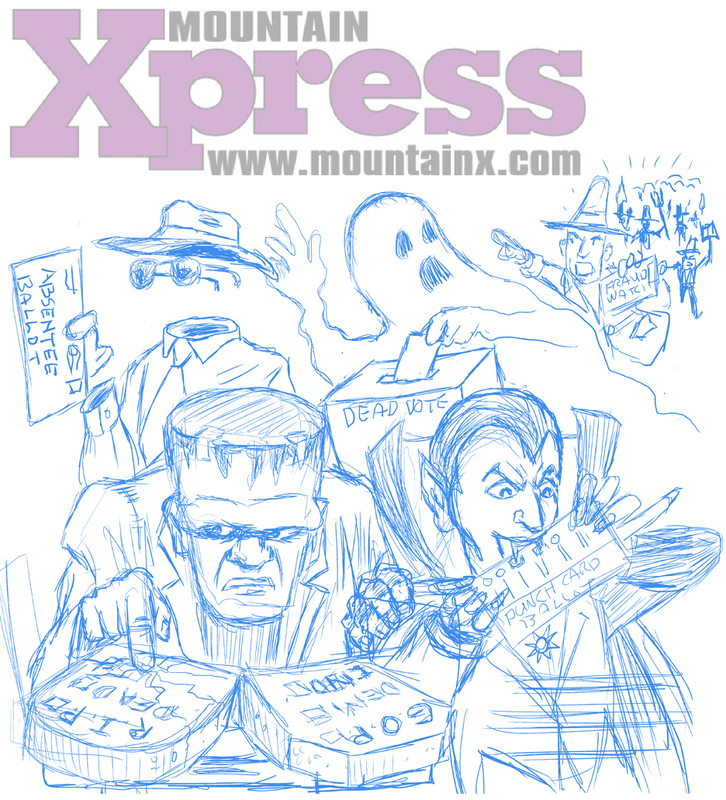 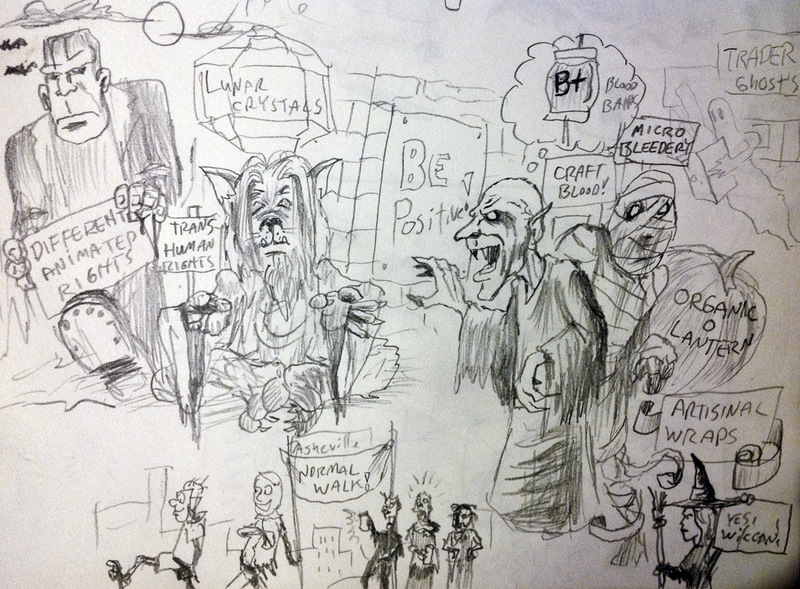 I gave them some roughs and thumbnails and sketches for some classic monsters (Dracula, Mummy, Invisible Man, Frankenstein’s monster, wolf man, etc.) 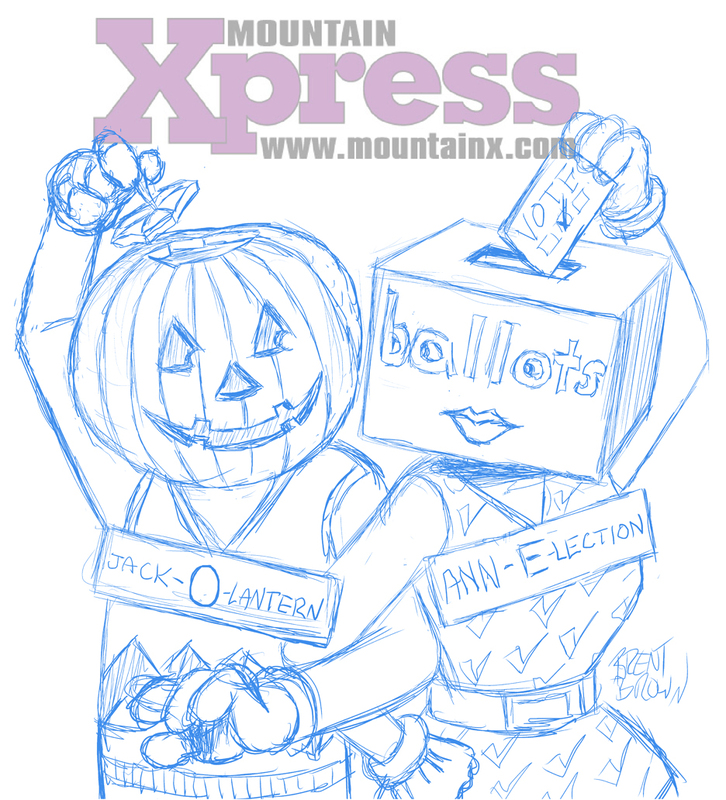 and, on a different tack, maybe a jack-o-lantern and a ballot box? 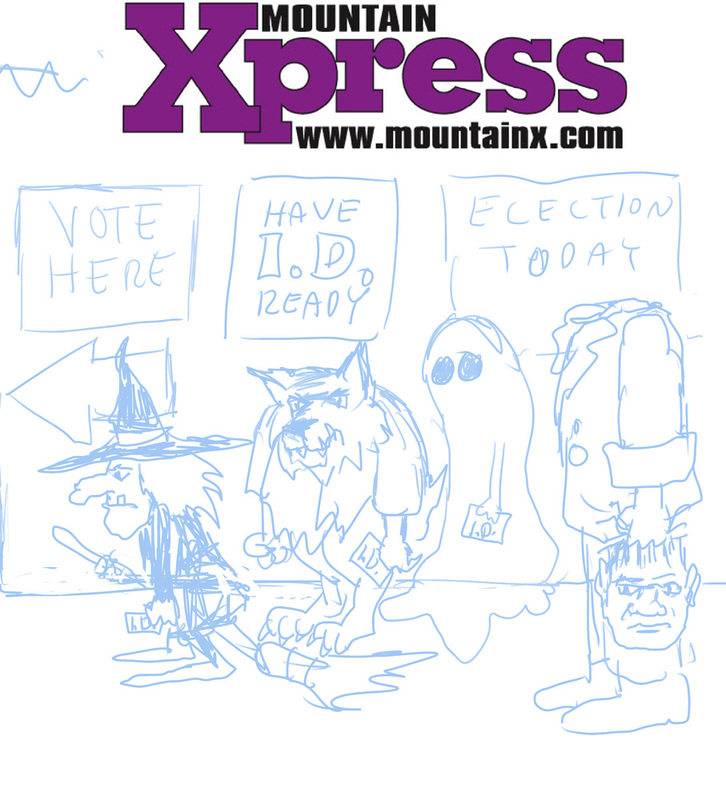 The invisible man is voting, of course, absentee ballot and a ghost voting reinforces the often-cited claim that dead people are voting in our elections, incurring the wrath of an angry, 17th century voter fraud mob. 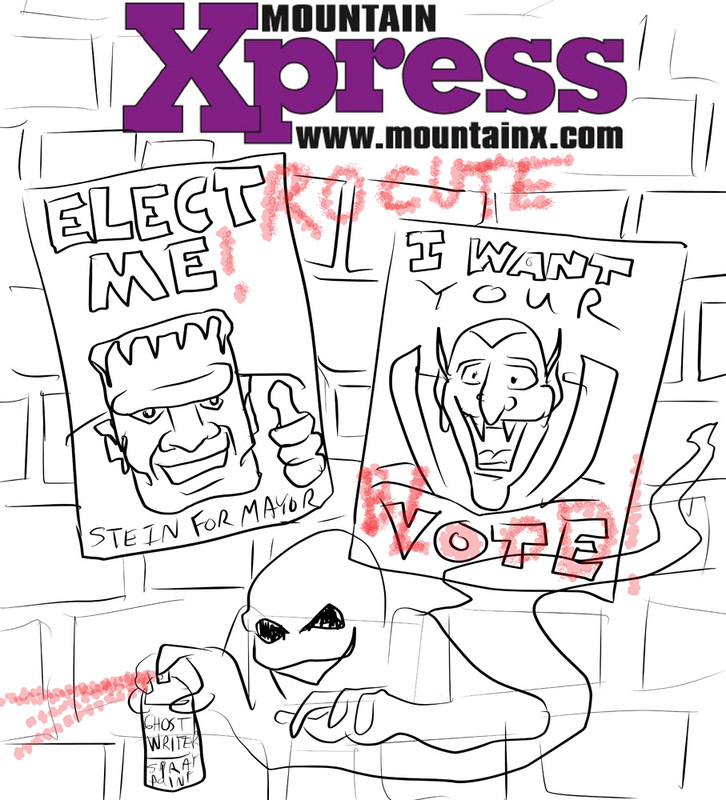 Dracula and his vampire fangs prefer punch ballots and Frankenstein’s creature doesn’t know his own strength when even using a tombstone touch screen ballot.